But another really interesting ARM distribution for the RPi is Arch Linux ARM . I was surprised to learn how easy it is to create your own image or customized distribution based on Arch Linux ARM ! 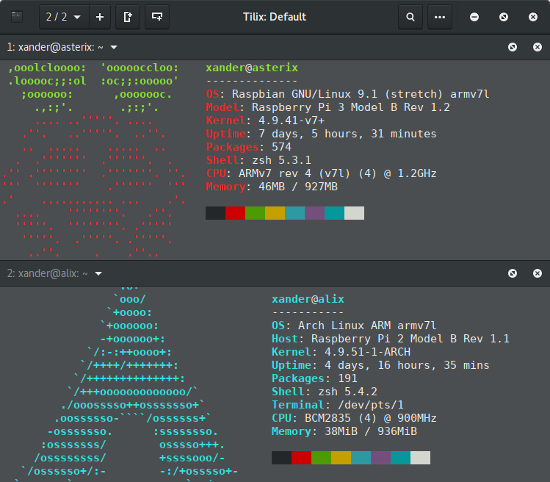 The remaining part of this blog post provides instructions and illustrates how a minimal Arch Linux image file for the RPi2 can be created with basic Linux CLI tools. In this step we create a loopback device so we can format and partition the image disk file like a normal block device file or hard disk. In short, a loopback device allows files to be interpreted as real block devices. In my case the loop device for my image file is /dev/loop0. Once we have partioned the image file, we need to reload the partition table of the loop device. This can be done using partprobe which informs the OS of partition table changes. In this step, we format the previously created partitions. In the following, we bootstrap the Arch system on the image file. As final adjustments, it's a good idea to resize the ext4 root partition so we don't run out of disk space. Otherwise, the root partition is limited to 1.9GiB. Afterwards, the system should be rebooted and the root partition be resized using resize2fs.